No, truthfulness does not wait for the convenience of those wedded to untruth before peeking out. Itbreaks out, as if from captivity, bearing witness to the One who sent it to run wild among us, and takes us on a giddy, and ultimately joyful ride. The Spirit does bring the peace that comes with truth, but not by following the schedule of those whose fear would hold it back. 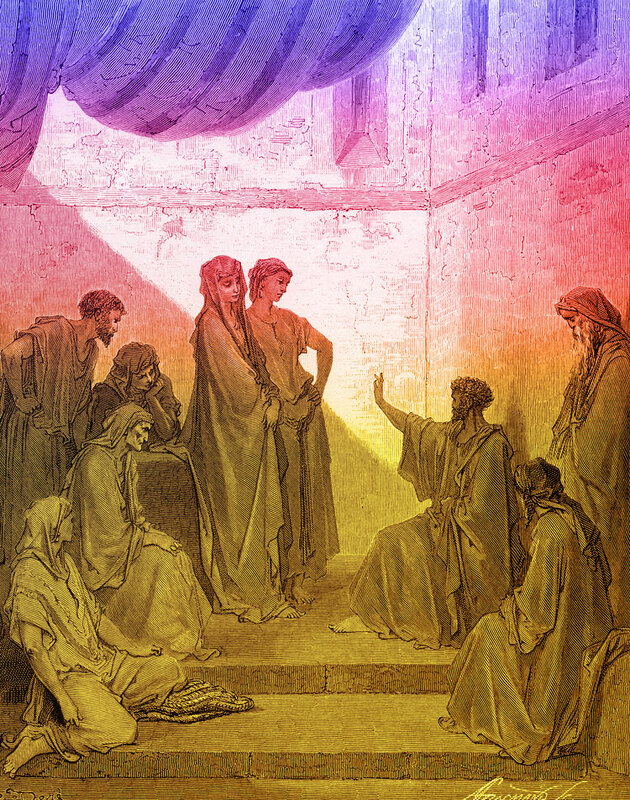 Peter was truly Petrine in listening to the Spirit and recognizing he had been wrong about what makes for holiness. It was in doing so that he became a precarious-seeming centre of unity who was in fact a Rock, while all the forces of reaction sought to buffet him about. Neither he, nor his colleagues, set the agenda or the timetable. Jason, is this really what you would be teaching? Redemption, I understand, is with a view to a Spirit-directed full participation in the plan of God for creation. Gentiles and Jews fully redeemed to participate anew, putting to death the deeds of the flesh – in order to live true life. God made us male and female, and this for the purpose of union in a marriage which is male-female, bearing witness to the marriage and union of Christ and his Bride. There is such a thing as wrongdoing in life, and we are redeemed to participate anew. I think James Allison is wrong. But in a different way to Peter. And Paul would call, and indeed does ‘call him out’ on it. Paul warns the Corinthians of ways that disqualify them from inheriting the kingdom. Thank you for weighing in, Trevor. While I have some thoughts on the subject (and may post these at some stage) I’ve never taught a course in human sexuality, and am I’m not even sure how I would go about doing so. But if I did have the opportunity to teach such a course, I know that I would want my students to engage with the likes of James Alison (and Eugene Rogers, Gerard Loughlin, etc.) who, incidentally, I think would agree with most of your comment, although not your premise for saying so. Theology and the proclamation it serves is not at all helped by the kind of closed-door approach that you seem to be advocating here. That’s Rowans Williams in a review of Allison’s Faith Beyond Resentment: Fragments Catholic and Gay (2001) (published in The Tablet, 10/11/01) — and what he says there is quite repeatable here. Allison is one of the most brilliant, bold, compassionate, irenic, and terrifically witty theologians we have. Thank God for him. And thank you, Jason, for this posting. My apologies for adding an extra “l” to his name: it should be James Alison, of course. Truly, God shows no partiality in His love for us – whether we are just or unjust. But, who is just and who is unjust in their reasoning and actions? Also, just because God loves a person, even in the midst of their disobedience, does not mean that person is justified – does not mean they will be saved. Salvation requires a choice: To obey God or To disobey God. And, God has revealed what is required for obedience. So, who is obedient and who is not obedient? God may oopen doors to help sinners to heal and come to obey (love) Him, but the “patient” must choose life which comes with obedience and service to God’s holy will. If one rests in one’s own will, and does not discern what is pleasing to God – what is required for human perfection, what then at the Judgment? I. I am the Lord your God; you shall not have false gods before me. • Have I rejected God’s revelation as it comes to me through the Scriptures and the teaching of the Church? • Have I sought money, power, sexuality, or any other lesser good as if it were the supreme good? • Have I despaired of God’s help? Have I taken for granted God’s mercy? • Have I placed faith in superstition? A dazzling cirque de soleil of faithfulness to the good news! Thanks for letting us share it Jason. Thanks Jason. I was not advocating a closed door policy. Simple drawing attention to the tricky human wisdom that sometimes hopes to supersede the Word revealed in Christ. Jason, were you are looking at writing a course in human sexuality (probably basic to this discussion), you may consider Judith S. Balswick’s ‘Toward a Practical Theology of Marital Sexuality’, in ‘Incarnational Ministry’ by Ray S. Anderson. And of course Geoffrey Bingham’s ‘God’s Glory: Man’s Sexuality’ would also be worthwhile reading, and engaging with it. Thank you Trevor. Two good suggestions, to which I would add Duncan Forrester’s essay, ‘Good and Gay?’, Rowan Williams’ essay ‘The Body’s Grace’, John Webster’s essay ‘Evangelical Freedom’, the relevant chapter (pp. 379–407) in Richard Hays’ The Moral Vision of the New Testament, Eugene Rogers’ books Theology and Sexuality: Classic and Contemporary Readings and Sexuality and the Christian Body, Stanley Grenz’s Welcoming but not Affirming, Queer Theology: Rethinking the Western Body edited by Gerald Loughlin, and Christopher Roberts’s book Creation and Covenant: The Significance of Sexual Difference in the Moral Theology of Marriage. I would also commend a collection of essays edited by Murray Rae and Graham Redding, More than a Single Issue: theological considerations concerning the ordination of practising homosexuals (ATF, 2000). The volume includes essays by Douglas Campbell, Ray Anderson, Darrell Guder, Alan Torrance, Murray Rae and others. You mention Ray Anderson, whose work I love. Did you ever read his three-part reflection on ‘Homosexuality and the church’, posted on Ben Myers’ site here, here, and here? Well worth a read. I think I have read that post on Ben’s site before, yes. Correction: the book I mentioned is in Honor of Ray Anderson, edited by C.D. Kettler and T. H. Speidell. @Trevor: I knew the one you meant. It’s a wonderful book.